The Celestron AstroMaster 114 and 130 Equatorial, or "EQ" telescope is a great choice for those who want to dive into the wonderful world of astronomy, but after a couple observing sessions, most people find that they need a few extra telescope accessories to increase their level of enjoyment. Once you start looking at all the choices for AstroMaster 114 accessories or AstroMaster 130 accessories, however, you may find that it is a little overwhelming. So many choices are available, and at so many price levels! That is one of the biggest surprises to new telescope owners...the sheer magnitude of products available for amateur astronomers today. Who knew? Celestron DC Motor Drive - This nifty AstroMaster acccessory allows the AstroMaster mount to automatically track the movement of the stars as they move from east to west across the sky. You will appreciate auto-tracking big time, because as you may have discovered by now, our planet rotates way faster than most people think, and objects move out of the eyepiece quickly, normally requiring you to regularly make manual adjustments in order to keep the moon, or any other object, in your eyepiece's field of view. With the Celestron RA Motor Drive installed on your AstroMaster EQ telescope, that task is done for you. 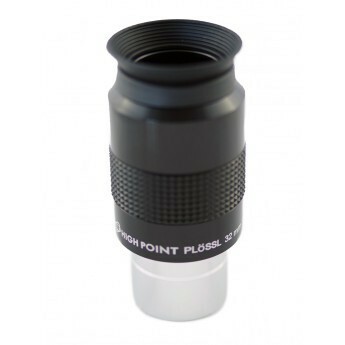 High Point 32 mm Plossl Eyepiece - Another eyepiece! Yay! Amateur astronomers normally have multiple eyepieces on hand, because that is how you change the magnification of the view through your telescope. The AstroMaster 114 & AstroMaster 130 telescope both come with two eyepieces: a 10 mm and a 20 mm. Adding a 32 mm eyepiece will give you a third magnification choice! Moon Filter - Have you ever turned a flashlight on and pointed it at your face? No, putting it under your chin in order to tell spooky stories around a campfire doesn't count...I mean were you ever silly enough to point it right at your eyes? And then you stumbled around in the dark, incapable of seeing practically nothing until your eyes adjusted to the dark again, right? Yeah, me too. Well, that is what it is like if you look at the Moon without the filtration of a Moon Filter to dim it down to a reasonable level. A Moon Filter helps you see the Moon better, just like sunglasses help you see your surroundings when there is a lot of glare being produced by sunlight on water or snow, etc. You need a Moon Filter, period. Or you can wear your sunglasses at night. Your choice. Attach this little black box to the RA (right ascension) slow motion shaft of your AstroMaster 130 EQ or 114 EQ telescope, turn it on, and let it do the tracking for you! This single axis motor drive basically compensates for the rotation of the Earth. Celestial objects slowly move from east to west across the night sky, and instead of continually making manual adjustments to your mount to keep, let's say Saturn, in your eyepiece, you can relax and really take your time to observe this awe-inspiring planet! You will still need to make occasional adjustments for the much smaller north/south movements objects make as they rise and set, but that is a piece of cake compared to east-west movement. 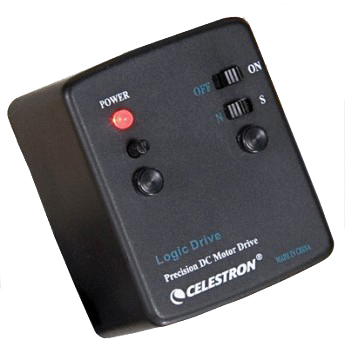 The DC Motor Drive by Celestron is simple to use. If you look at the picture to your left, you will see a simple "on/off" switch and a "N/S" switch. If you are observing in the Northern hemisphere, move the switch to the N, and choose S if you are in the Southern hemisphere. On the left side of the box you have the power indicator, and below that, there is a little knob that allows you to increase or decrease the speed of the motor. The two larger circular objects on either side (below the speed adjustment knob and the N/S switch) are mounting screws. The AstroMaster Motor Drive is powered by one 9v alkaline battery. This can power the drive for up to 40 hours, depending on the motor's speed setting and what the temperature is like outside. To insert a battery (user supplied), you simply remove the back cover. Another eyepiece is a welcome addition to any amateur astronomer's accessory case. The High Point 15 mm Plossl Eyepiece is full-sized, and will fit the focuser of your AstroMaster 130 or AstroMaster 114 EQ telescope. Since the Celestron AstroMaster 130 & AstroMaster 114 both come with two eyepieces, adding this one to your arsenal will give you three magnification choices. When you're ready, we recommend you also purchase a High Point 2X Barlow Lens. With three eyepieces and a Barlow, you will have SIX magnification choices, and that really gives you some observing flexibility! Plossl eyepieces have a 52° field of view and, depending on the brand and focal length, reasonable eye relief. The High Point 15 mm eyepiece has 13 mm of eye relief, which is comfortable for most observers. A rubber eye guard increases the observing comfort, and will help keep stray light from bouncing off of the optics. Extraneous light is further eliminated by blackened optical edges. The Moon is a beautiful object, and it is usually the first thing a new telescope owner will swing to, even if they've seen it a million times. There is so much to see on the Moon, and you can spend hours sketching its hills and valleys, it's mountains and craters, and traveling along the terminator (the point where shadow meets light when the Moon is neither new or full) is a treat that this astronomer never tires of. However, the Moon is also amazingly bright! Even when it is in its partially lit phases, the scene is just too much for our eyes to handle comfortably. Remember, we are not just using our eyes to look at the Moon, we are using a telescope whose job it is to collect all the light it can...and as far as your AstroMaster telescope is concerned, it will hit the light jackpot when you turn it moonward. A Moon Filter is a simple device. It screws onto the bottom of most any eyepiece you will ever buy, and instead of squinting, your eyes will relax and you will be able to fully enjoy all that the Moon has to give. You can use your Moon Filter on Venus as well; it helps you see her phases better. 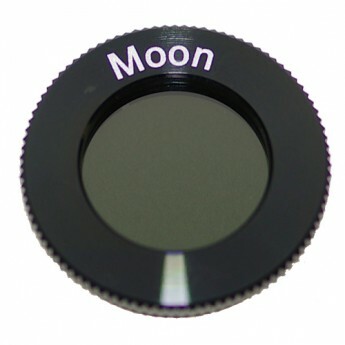 And if you are using your telescope terrestrially, the Moon Filter may come in handy if you are observing over water or snow, or anything with a lot of glare, like sun on glass or chrome. Just think of a Moon Filter as a pair of sunglasses for your telescope, but whatever you do, don't use this filter for the Sun! It is called a Moon Filter for a reason. In fact, if you've made it this far in this article, congratulations, and here's a hint that may save your eyes, or the eyes of someone you love someday. If you ever come across a filter that looks like your moon filter except it says "SUN", throw it away. No wait, take a hammer, smash it up into a million pieces, and then throw it away. These "Sun" filters used to come with telescopes a few decades ago, and they are dangerous. The adhesive that holds these filters together cannot take the heat generated by the concentrated power of sunlight through a telescope (think magnifying glass and burning ants) and they have been known to fall apart at just the wrong moment. So throw those suckers away, and if you know of anyone that has one, tell them to do the same. There are proper solar filters available for your AstroMaster telescope, but they filter the damaging rays of the Sun before it enters the telescope, not afterwards. If you are interested in the safe viewing of our Sun, which we highly recommend, contact one of our sales staff at High Point and we would be glad to help you pick it out.